Pierre-Emerick Aubameyang has sounded his take on Unai Emery's choice of player selection which he does not like. The Gabonese international took advantage of a Ben foster blunder in the 10th minute of Arsenal's encounter with Watford on Monday night to earn his side a 1-0 win. The striker's 18th league goal of the season ensured that the Gunners left Vicarage Road with all three points and their first Premier League away clean sheet of the Unai Emery era. Their hopes of returning to the Champions League following a two-season absence was also revived as they leapfrogged rivals Manchester United and Chelsea to cling fourth position. 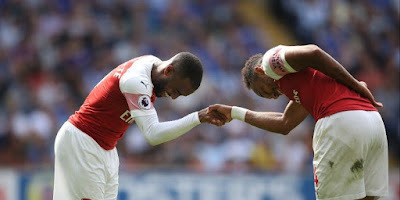 Auba, despite Arsenal's triumph, has revealed that he was disappointed by the boss' move to leave Alexandre Lacazette on the bench all through the tie. He reiterated his desire to always play alongside the Frenchman but admitted that he does not want to talk to avoid the manager's wrath. “Everybody knows that I like to play with Laca because we have a great partnership,” the Gabon star told Sky Sports, as per Metro Sport. “Sometimes one plays, the other is on the bench. It’s like that. You have to fight for the team. Emery's tactics against the Hornets was probably one adopted in order to rest players for the clash at Naples this Thursday but Aubameyang's strong partnership with Laca won't make him see it that way. The duo no doubt are best of friends and records have shown that the team performs better when they both play. Wait! Our Black Panther mask man said he doesn't want to talk? Lol! He has done that already though not directly to Emery. Whichever ways, the manager will still get to hear of it in the media and what will be will still be.